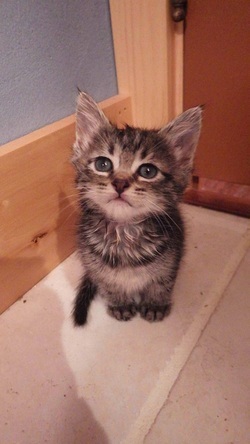 Chariclo is one of ten kittens dumped in the road to perish. Not one to take things personally, she's decided to be the happiest cat she can be! This is the kitten that is involved in all the aspects of her foster home, without being a pest. Is your life lacking in companionship? Adopted with her fellow dumped kiiten, Aramis!